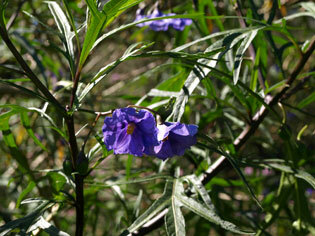 Solanum sp. (Probably a generic term for Solanum species (Solanaceae) and similar berry-bearing plants). The word poroporo was thought at one time to to have been derived from a Proto-Oceanic word, reconstructed as *mpodo, however further research by the authors of The Lexicon of Proto Oceanic has indicated that the Solanum species to which this word typically refers were not present before contact with European and other newcomers over the last few centuries in the areas where the modern terms are found on which the reconstruction was based. It's probable that the apparently cognate words were introduced along with the plants bearing their names at some later period. The word seems rather to have originated in the Fiji-Rotuma area (the modern forms are poro in Rotuman and boro in Fijian) during the development of the Proto Central Pacific branch of Austronesian, still a long time ago (perhaps as much as 3,000 years), but more recently than Proto Oceanic. Within Polynesia, including Aotearoa, the reflexes of *polo have been used to name a variety of members of the nightshade family (Solanaceae) and a few other plants that have similar berries, like the endemic "pokeberry" Phytolacca sandwicensis, not a member of the Solanaceae, in Hawaii, and the "Romazoff shrub", Hedyotis romazoffensis, a member of the coffee family (Rubiaceae), in Pukapuka, Tuvalu and the Tuamotus. These names have been conferred on introduced as well as native plants. 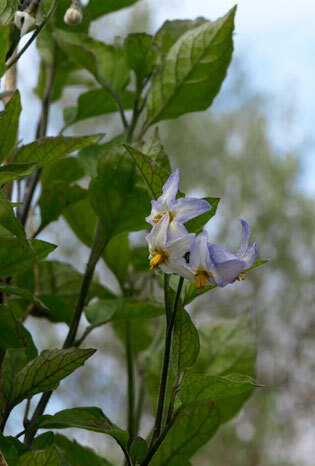 Thus throughout its range in Polynesia, Solanum nigrum, "black nightshade", and the similar S. nodiflorum and S. americanum, whether native or introduced, are likely to be known polo, poroporo, pöpolo, or some cognate term. One interesting plant is the cultivated variety S. viride cv. anthropophagorum -- the "cannibals' solanum" according to its Latin name, a Polynesian introduction into the Cook Islands, known there as poro'iti (the Tahitian porohiti). 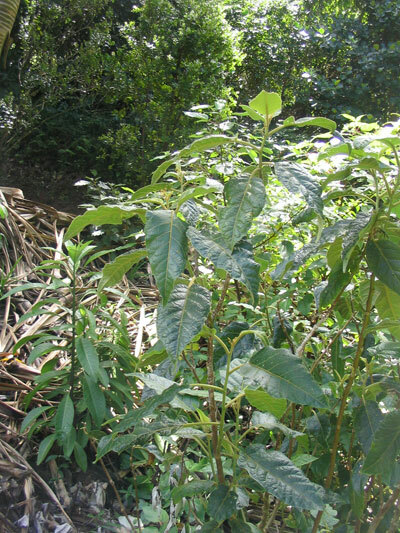 The photograph below (left) is of a plant of one of the Hawai'ian pōpolo, Solanum americanum, in the Limahuli National Botanical Garden, Hanalei, Hawaii. Phytolacca sandwicensis - "Hawaiian Pokeberry"
Further information : There is an excellent account of some of the Cook Islands species of pōpolo / Solanum (native and introduced) in the Bishop Museum database: http://cookislands.bishopmuseum.org/species.asp?id=6655. This site also has an illustrated page on Hedyotis romazoffensis. 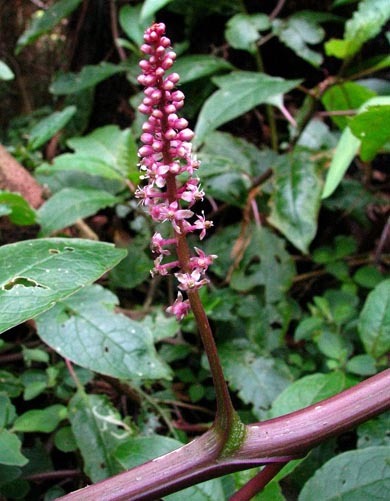 Photographs: Phytolacca sandwicensis, David Eickhoff from Pearl City, Hawaii, USA -Licensed under Creative Commons Attribution 2.0 via Wikimedia Commons; other photos, R.B.